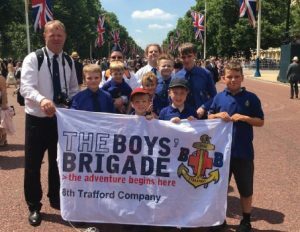 Over 100 members of The Boys’ Brigade came together in London on Saturday 17th June for Trooping the Colour to celebrate HM The Queen’s Official Birthday. The group watched the ceremony on Horse Guards Parade from a special youth enclosure alongside other youth organisations including Girl Guiding. BB members then made their way up The Mall towards Buckingham Palace for the balcony appearance by the Royal Family and the RAF flypast which included The Red Arrows. This was a fantastic experience for all that attended and certainly a day to remember. If your Company is interested in attending next year then watch out for details which will be circulated in March/April.